Robinson Real Estate: Committed to your rental needs! Robinson Real Estate has been helping area property owners find great tenants, and helping renters find great apartments and homes in Northampton and surrounding towns in Massachusetts since 1992! 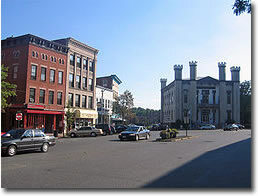 Our office is located at 35 State Street in Downtown Northampton. Robinson Real Estate handles real estate rentals only, we do not handle real estate sales.We focus solely on finding you the perfect rental apartment, home, or condominium. In the 27 years that we have been handling rentals in Northampton, we have established great relationships with literally hundreds of area landlords, and we have helped thousands of clients find their new rental. We are selective in choosing the properties we are willing to advertise and show, and market only clean and well maintained rentals. Click on the "Rental Listings" tab to view a sample of our properties. If you don't see what you are looking for listed on our website, please give us a call, our places rent quickly and don't always make it to our website!